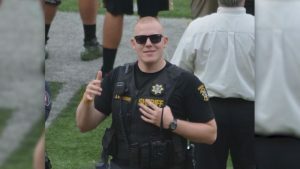 COWLITZ COUNTY, Wash. (CNN) – A suspect is dead in connection with the shooting death of a deputy in Washington State. Authorities responded to a report of a suspicious person on a road Sunday night. Officers found the person and shots were fired. The suspect died but no other officers were hurt. Deputy Justin Derosier was responding to a disabled vehicle Saturday night when he was shot. He later died at the hospital. Derosier leaves behind a wife and a six-month-old daughter. He was 29 years old.